The Long Ridge Community’s Anderson Rosenwald School will serve as a Community Cultural Center intended to promote a fuller understanding of southern Appalachian black history and to enhance education at all levels. Madison County, NC, operated a black school from the early 1900’s until schools were integrated in 1964. Research on this school is a work in progress; therefore, the following information is provisional. 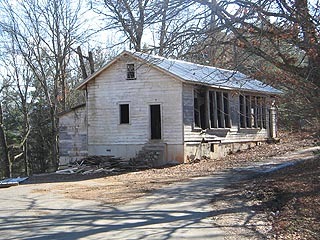 Information was prepared in support of the Rosenwald School Project in Mars Hill, NC, by a planning committee composed of Dorothy Koon, Edwin Cheek, Pauline Cheek, Richard Dillingham Chair, and Charity Ray. Both Ms. Koon and Ms. Ray attended the Anderson Elementary School (Rosenwald) in the 1940’s. It is surmised that from 1902 through 1905 there were three colored schools in the greater Mars Hill area: Grapevine, Mars Hill, and Middle Fork neighborhoods (Moore Papers, Mars Hill College Archives). Richard Dillingham surmises that Madison County consolidated these three schools into Anderson Elementary School which was named for Joe Anderson, the Mars Hill slave who went to prison to provide collateral for Mars Hill College’s indebtedness (John McLeod, FROM THESE STONES). The property on which this Rosenwald school was constructed was secured in 1927 (Madison County Schools Archives). Students from this school have attracted both state and national attention, see historical moments.